In response to the call of the Department of Tourism Secretary, Alberto Lim, to promote Food tourism in the country, the Negros Cultural Foundation has initiated its own. 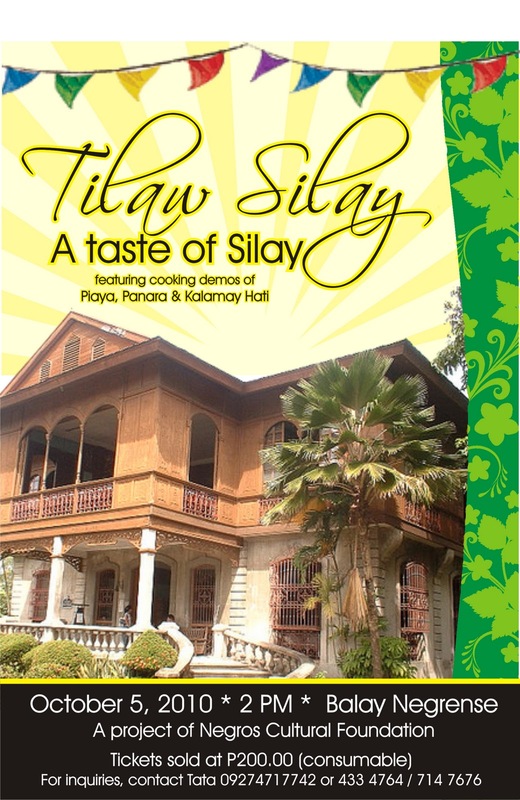 The Negros Cultural Foundation will launchTilaw Silay on August 24, 2010 to keep alive the tradition and preserve the rich heritage of Silay City as the food capital of Negros by introducing food tours. We proudly invite you and the members of your organization or association to taste the food products of Silay City through an on the spot cooking-demo and sale of these food items at the Balay Negrense grounds. We welcome you to help us evaluate our presentation before this event can be one of the tour destinations of Negros. Tickets will be sold at P200 per person which you can use to purchase various food items. As an added attraction, the artists and artisans of Silay City will exhibit their works and make them available for sale. We are very positive that this event will once again make Silay City shine as the center of arts and culture of the province and we are seeking your kind support for this endeavor.